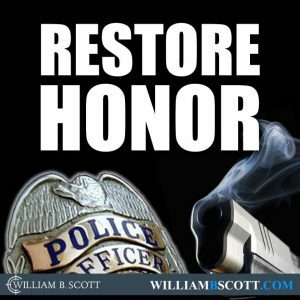 RESTORE HONOR: Has Cop-Hunting Begun? Between May 1, 2013, and October 18, 2014, U.S. police officers had killed 1,628 people, based on news accounts and “corporate” reports assembled by the dedicated trackers at KillingByPolice. At least 875 citizens have been killed, since January 1, 2014. Cops are now killing Americans at the rate of three per day, every day of the year. Despite a congressional requirement to do so, most police departments don’t report the number of officer-involved fatalities to the U.S. Department of Justice. And the FBI doesn’t bother demanding that every law enforcement agency submit an accurate accounting of deaths at the hands of sworn officers. Consequently, the feds only show about 400 officer-involved deaths per year, a number often cited by news media talking heads, who consider that a low, acceptable figure. The real tally is more than 1,000 deaths attributed to police officers every year, a sum that is trending sharply upward. In contrast, organizations such as the National Law Enforcement Officers Memorial Fund (NLEOMF) maintain meticulous records about the number of cops killed. In fact, this group can tell you how many officer deaths have been recorded, since 1791—more than 20,000. Over the past 10 years, 100-150 officers are killed every year, but the trend is downward. Something has changed, however, and a new, dangerous element has the nation’s most astute law enforcement professionals seriously worried. Based on preliminary 2014 statistics posted by the NLEOMF, total police officer fatalities are up 14 percent this year, and firearms-related deaths are 56 percent higher than in 2013. What scares smart cops across the country, though, is how some of these officers died: They literally were hunted down and killed. For example, Las Vegas Metropolitan Police Department (“Metro”) officers Igor Soldo and Alyn Beck were shot to death, while eating lunch, on Sunday, June 8, 2014. Two assailants, Amanda Miller and Jerad Miller, walked into an east Las Vegas pizza restaurant and shot both officers at point-blank range. Reportedly, they yelled, “This is a revolution!” and stripped the officers of their weapons, before running to a nearby Wal-Mart. There, they killed a bystander, and both of the Millers subsequently died, during a shootout with responding police officers. More recently, Pennsylvania State Police Corporal Bryon Dickson, II, was shot to death and Trooper Alex Douglass critically wounded, when they were ambushed near a police barracks. Allegedly, Eric Frein shot the two troopers from a concealed position on September 12, then disappeared into the Pocono Mountains. 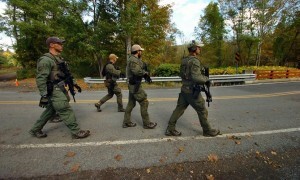 To date, Frein, a self-described survivalist, has eluded up to a thousand FBI agents and local police officers. A common post-shooting element in these and similar egregious attacks on police officers is how they are depicted by law enforcement and political officials. Both the Millers and Frein were quickly characterized as crazy, whacked-out nut-cases, anti-government neo-Nazis, and revolutionists. Now on the FBI’s “Ten Most Wanted” list, Frein was labeled “evil” by a police spokesman a few days ago. Why did these assassins intentionally hunt and shoot cops, apparently at random? How could one man manage to avoid a thousand highly trained officers, all equipped with state-of-the-art technology and weapons, for more than a month? 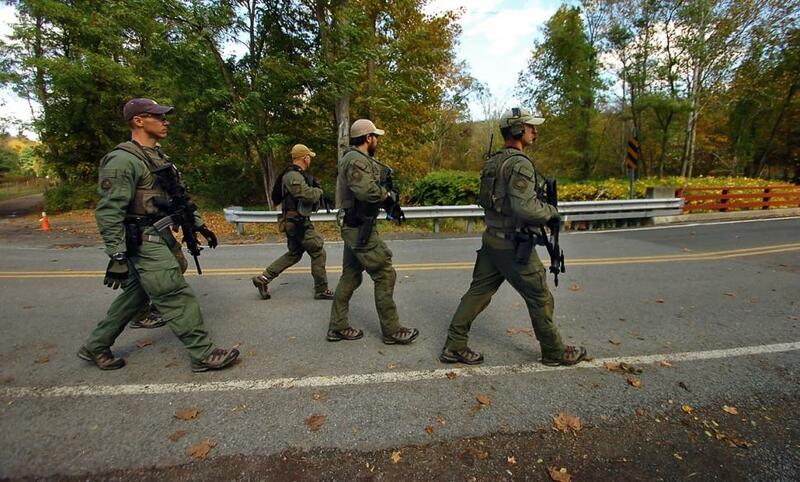 Is Frein being aided by local sympathizers? What if the Millers and Frein really aren’t fringe nut-cases? Will the epidemic of questionable shootings by police officers in recent years motivate thousands of furious, mainstream American citizens to take up arms and hunt cops? Is this the beginning of a much wider, unstoppable war on police officers? Clearly, Americans are frustrated and fed up with killer-cops, who are quick to shoot and quicker to lie about what happened. Angry citizens also have lost patience with local and federal agencies that rarely hold badged killers accountable. In general, millions of Americans believe that cops have a license to kill, and a nearly 100-percent likelihood of getting away with blatant murder. But a few professional officers believe the tide has already turned, because the natives are revolting. In Albuquerque, New Mexico, where cops have shot 37 people, killing 23, since 2010 (as of March 2014), citizens took to the streets and demonstrated for 12 hours, after the fatal shooting of James Boyd, a homeless camper, was released on video. During a subsequent city council meeting, furious Albuquerque residents attempted to arrest the chief of police and mayor, forcing both to make a backdoor escape. Finally responding to citizens’ demands, the U.S. Department of Justice (DOJ) conducted an investigation and issued a scathing report that documented “patterns of excessive force by the Albuquerque Police Department, serious constitutional violations and a lack of training and oversight of its officers,” according to an Associated Press story. The backlash that erupted in Ferguson, Missouri, after a police officer shot and killed unarmed teenager Michael Brown, thrust the issues of police militarization and excessive-use-of-force into Americans’ living rooms every night for weeks. Even rabid cop-apologists were shocked by TV images of officers in military gear manning machine guns atop armored vehicles rumbling through the streets. Suddenly, Ferguson looked more like a Third World nation under the thumb of a powerful occupying army than a Midwestern American suburb. Dozens of reporters in the U.S. and Europe also recognized that Ferguson’s demonstrations and riots were far more than a local, race-related response to a single shooting. News media were hearing from thousands of outraged citizens, who were locked and loaded, fully prepared to rise up against arrogant, lying police officers that were killing at will and getting away with it. Indeed. And the prospect of citizens hunting down police officers, because local, state and federal governments refuse to hold killer-cops accountable, is equally serious. Still, most elected leaders adamantly refuse to face the reality that full-scale rebellion is but a whisker away, particularly in cities and towns besieged by imperious thugs decked out in helmets, camouflage uniforms, night-vision goggles and bullet-resistant vests, and toting military-grade rifles. Most of the roughly 900,000 law enforcement officers in the U.S. are honorable professionals dedicated to protecting and serving their taxpaying employers. Unfortunately, they are forced to work alongside thousands of corrupt thugs and killers, who should never have been hired, should never have graduated from a police academy, and should never have been issued a badge and firearm. Good cops in dozens of cities, such as Las Vegas, estimate that 25-30 percent of their fellow officers qualify as “bad” or outlaws and rogues. And, as long as the latter are allowed to abuse, brutalize and kill civilians, they are endangering their uniformed colleagues. I sincerely hope that America doesn’t explode in armed rebellion, because a few thousand killer-cops are never held accountable. Time is running out, though. Police chiefs, sheriffs, and political leaders at the local, state and federal levels must immediately launch aggressive campaigns to regain citizens’ trust and rebuild protect-and-serve cultures. RESTORE HONOR: Tip #1 — Rid the ranks of rogues. Law enforcement and political leaders absolutely must take aggressive steps to get rid of malfeasant police officers. Enlisting every officer to identify their corrupt, abusive “brothers-in-blue,” and protecting each cop from coworker and powerful police union repercussions, is an essential, mandatory first step. Break down the “Blue Wall” of mindless mutual protection and purge bad cops from your ranks. If you don’t, every law enforcement officer and agent in the nation will be at risk.